Hello everyone! It's time once again for a fabulous Doodle Pantry release! Today Laurie is releasing 7 new stamps sets, 4 SVG cut files and 26 sets previously sold at CDS. So, pop on over to the Latest Releases for November 2013. I am using the new set called Igloo Fun. Wow, did I have "FUN" making this one too! To make this card, I opened one of the PRECOLORED images with my Silhouette Cameo and traced it (I had to leave off the ground doodles). I then did a print and cut. Using Copic marker B00, I added a little more blue to the igloo. I knew I was going to be using glossy accents and I didn't want it cover up the light blue that was used and make it appear all white. I also used Frosted Lace Stickles glitter glue on the snowballs, penguins and walrus to indicate snow that had fallen on them (that is part of the precolored image). I used 2 of the digital papers that come with the set, one patterned image and one solid. The card is 6" x 6". I used a white card stock base, then added black card stock, then the patterned paper and then a 1 1/2" strip of the solid paper layered not quite in the center (it's hard to see because of all the other things added). I added a white satin ribbon across the middle and then added a bow to that. Next is another layer of white card stock, black card stock and white card stock embossed with Cuttlebug's Dot embossing folder. I added 2 large snowflake brads to the corners and once the image was dried, I added it to the top using pop-up dots. I printed the sentiment from the same set and used Spellbinder's Classic Ovals to cut them out and then distressed it with bashful blue ink from SU (which was a perfect match to the papers I chose) and mounted it in the corner. Don't forget to head over to Doodle Pantry's Blog at 12:00 p.m. ET to play along with our challenge (DPDC40). 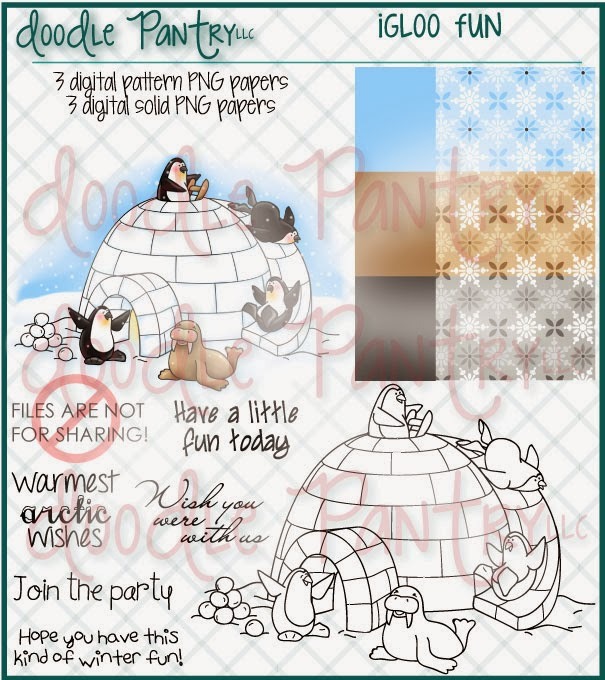 You can use any digi stamp you wish to be eligible for the $15 gift certificate, but to get this month's stamp set Snowman Pileup for free, just for entering, you MUST use a Doodle Pantry image. There are lots of free stamp sets being released and also free with purchase sets to get you started. Be sure to add them to your cart before checking out. Isn't this set adorable? Absolutely gorgeous! Your design is fabulous and I love the addition of the glossy accents. Beautiful embellishments and embossing. Far too many people have far too little fun. This card however is just fun everywhere you look. The little gems at the end of the snowflakes are super sweet.This is just so adorable and I really like the colors you have used. We all appreciate you posting this beautiful art with us. PLEASE come back. Thanks for sharing with us this week, Susan! It's such a blessing to have you share your lovely art in our challenges. Love every inch of your card. Thanks for sharing at Handmade Harbour. This is such a fun card. The shiny igloo is my fave! Thanks so much for joining us at Handmade Harbour and hope to see you again soon. OMWord, beautiful, stunning, cute and clever all wrapped up into one. Wow, the detail of everything is awesome and I can see all the work. Everything shines, glistens and pops with textures. Too cute Susan!!! Love the glossy accents and snowflake embellies. So sweet! Awesome card!! I love the glossy accents on the igloo! It really stands out fussy cut against the embossed BG! Fun card!! I love your card. The igloo is so cool with the glossy accents. Thanks for joining us this week at Creative Corner. Impressive use of the igloo image, love the glossy accents and how you added the gems to the snowflake embellishments. Gorgeous card! Fabulous igloo! Love the frosty feel! Thank you for sharing with us at Card Crafter's Circle! What a gorgeous holiday card Susan! Just beautiful and I love the way you've used Glossy Accents on the igloo. What a wonderful card with such wonderful image. Made me feel Brrr!...LOL Love how you applied glossy accent to the igloo for the shine. Thanks for sharing your creation with us this week at Word Art Wednesday. God bless, always! I love how that Glossy accents made that igloo come to life! AMAZING job Susan!!!! Love everything about this card! Susan, gorgeous card! I LOVE the shine on the igloo, the additions to the snowflakes and that bow! Very nice! Oh the glossy accents are perfect. Love those snowflakes too with the jewels. Beautiful work. What a gorgeous scene. I love the glossy igloo and the layout! Beautiful all around. Susan - LOVE LOVE LOVE this one. The whole card is just amazing. Great effect on the igloo with that glossy accents. Love that stuff. Hugs. I LOVE this card, so pretty and fun! !